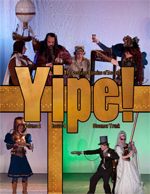 Hot off the press: The YIPE! Steampunk Special » YIPE! 48 Steamy pages! Featuring the return of beloved YIPE! writer Leigh Ann Hildebrand for the hard question we all have to ask: what happened to the punk in Steampunk? Our popular columnist Espana Sheriff retorts in her latest Sheriff Don’t Like It, then I ruin the whole flow with some short fiction set in an alternate history Nieuw Amsterdam. We finally get back on topic with Steampunk Punk Priestess Mette Hedin in a new YIPE! feature: 10 Questions for a Costumer featuring this month’s sacrifi– guest, Kathe Gust. I am the PR Director for the event known as WILD WILD WEST CON. We are hosting a STEAMPUNK meets the WILD WILD WEST event in Tucson Arizona March 2011. We would like to invite anyone with an interest in Steampunk to check out our website. Our event is a unconventional convention. We will be at OLD TUCSON STUDIOS for three days. This offering a real live experience among a working film studio specializing in the Wild West! We are looking for Vendors of all sorts that relate to Steampunk. We will host a fashion show, tea party, two dances, dinner theater. Live performances from ABNEY PARK, THE STRAND, and many many more. « Yipe! Another issue already?